Rangers say an update on their business review will be issued on 25 April after fans' groups backed calls to withhold season ticket money. 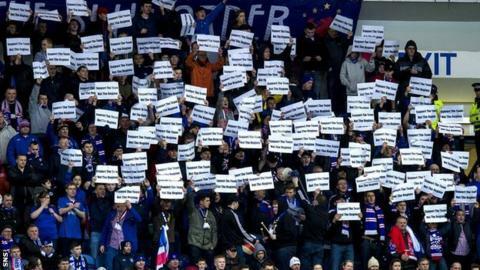 The Union of Fans wants supporters to instead pay into a trust fund set up by former director Dave King. It says the money will be released once the fans are given security of Ibrox Stadium and the club's training ground. King had alleged Rangers would not reveal details of their findings until "funds had been largely collected". However, a statement on the club website reads: "The board confirms, in accordance with its previous announcements, that the business review will be completed as planned and an update will be issued to shareholders and supporters on 25 April, ahead of the season ticket renewal deadline as previously indicated." The Ibrox board pledged to release details of chief executive Graham Wallace's business review, which he said at December's annual general meeting would take 120 days, before fans were asked to renew their season tickets. That period is up on 17 April, with Rangers having set a 6 May deadline for season ticket renewals. King has led criticism of the League One champions after cash reserves fell by more than £17.5m last year and a £1.5m loan from two shareholders led to questions over the club's immediate future. "Their haste to release renewals before the completion of the 120-day business review has now forced our hand," said the UoF, an umbrella body for several fans' groups, prior to the latest club announcement. "The money placed into the account will be released to the club, in full, as soon as they agree to give season ticket holders a security over Ibrox Stadium and Auchenhowie. "There will be no drip-feeding of funds and we do not consider that the board has any legitimate reason to reject this proposal. "We do not consider that there is any prospect of this action forcing the club into administration. "It would be a gross dereliction of directors' duties for this board to allow that to happen when substantial investment is on offer to them and when they can ensure they receive all season ticket money by securing Ibrox and Auchenhowie in favour of season ticket holders." Even so, the fans group admitted it was concerned that "even with all the season ticket money available to them, they will not be able to complete the season without further investment". Its statement comes on the day when Rangers announced a new three-year shirt sponsorship deal with online casino company 32Red. However, according to the notes in last month's interim accounts, without an increase in season-ticket sales, Rangers could not be certain about their going concern status for the next 12 months. "For the past two weeks we have, through a third party, put forward a plan to Graham Wallace which would have seen a security over Ibrox and Auchenhowie granted to trustees in favour of all season ticket holders," added UoF. "The security would have diminished as games were played and would have been discharged at the end of next season. "We felt this would provide the board with an opportunity to build trust with fans over a reasonable period of time. "We have received no response from the board to this proposal, or to the offer of a meeting to discuss things amicably."